These multi-purpose driveline support reinforcement plates can be used on all 1984 through 1996 model year (C4 or 4th Generation) Corvettes. We have found that most C4 Corvettes inherently experience a slight amount of twisting at the fastening points of the support beam to the transmission and differential housing connection surfaces. Although fastened with high grade bolts, self-locking nuts and adhered with factory sealant, the driveline components of the C4 Corvette still experience some level of counterforce load-induced lateral deflection between the members while under heavy loading. This allowance of flex in the driveline beam fastening joints creates a condition where the chassis structure must additionally contend with. One common side effect of this phenomenon is where the rear of the vehicle tends to kick out to the right during aggressive high RPM gear shifting. Notice that the C5 or 1997 and newer Corvette was redesigned so that lateral deflection of the driveline is practically non existent. The C5 Corvette driveline consists of a drive shaft within a tube that has a bell housing fused to each end. Pros: ZR51 Performance C-Beam Plates are relatively inexpensive and take a couple of hours to install with the most time consuming part being removal of the car's exhaust system so you can access the C-beam. One of the great things about America is that just about anyone with a useful idea, some smarts and a willingness to work hard can start a business and be successful. Such is the case with Bill Boudreau's ZR51 Performance. Bill is an '89 C4 owner who took an early interest in those cars' ZF S6-40 six-speed manual transmissions, becoming one of the first independents to go into business overhauling them. His work with the '89-'96 C4 powertrain had him developing ZR51 Performance's "C-Beam Plates," originally, as a way to make the job of changing transmissions easier. By accident, the product turned out to be one of the more useful improvements to a C4's at-limit handling. The C4 powertrain is all one piece with the engine/transmission unit attached to the rear axle housing with a section of aluminum channel which GM calls a "Support Beam" and many C4 enthusiast call a "C-beam". The beam attaches with long bolts which extend upward, though the beam, the trans and axle housings and threading into self-locking nuts atop the beam. To remove either the transmission or the rear axle requires at least sliding the beam forward or backward, and sometimes removing it. Either way, you need to get those nuts off and that requires manipulating a wrench in the confined and invisible space at the top of the driveline tunnel, directly above the Beam. 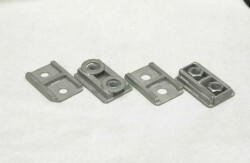 The C-Beam Plate Kit consists of four, stainless-steel plates, two for the bottom of the beam and two for the top. Each bottom plate is a reinforcement through which the bolts are inserted. The plates on the top of the C-beam are reinforcements but, also, contain threads into which the bolts screw. Because each top plate accepts two bolts, they allow tightening of the bolts without a wrench to hold any nuts. In late 2001, Bill installed the prototype of this product on his '89 six-speed coupe and went for road test. He immediately noticed that the car's behavior during power shifts had changed. Previously, the car exhibited the standard, C4-manual quirk of a little "twitch" to the right just as you pop the clutch after a shift. With the C-Beam Plates installed, the twitch was gone. To validate his discovery, he went back to the shop, got the car up in the air, took the Plates off and put the O.E. nuts back on. He road tested again and the twitch to the right on hard shifts returned. So...how did such a simple modification end-up affecting vehicle dynamics so much? The C4 powertrain has not proven as stiff as it should have been. Under high torque loads, especially during significant and rapid torque load changes, both the C-Beam's slight flexibility and the powertrain mounts' compliance combine to cause deflection of the beam and the rear suspension. The result is that little twitch or "jump" to the right during shifts. C-Beam Plates stiffen the two weakest areas of the transmission-tailhousing/C-Beam/axle-housing system: the bolted joints between the trans and the beam and between the beam and the axle. The addition of the Plates makes a large, localized increase in the system's stiffness such that flexing is reduced. The result is the car's twitchy behavior during shifts is significantly lessened and straight-line stability is enhanced. Later in development, Boudreau noted that C-Beam contact surfaces on transmission and axle of a powertrain with no Plates showed a characteristic, material migration between the surfaces of the Beam and that of the trans and axle, a sure sign that there is movement of the beam ends in-spite of the bolts being tightened to specifications. After installation of a set of C-Beam Plates this migration virtually ended. Yet more proof that this product was stiffening the powertrain. This is the C-Beam mounting surface of a near-new ZF S6-40 tailhousing. Note little or no marks. Bill realized his new product had more value to C4 enthusiasts, particularly racers, than just as an easy way to reinstall the C-beam and began marketing it as a performance enhancement rather than a service aid. Since then, ZR51 Performance has sold hundreds of sets of C-Beam Plate Kits to C4 drivers who run their cars hard and want improved straight-line stability during shifts. Several years ago, when I first heard of the ZR51 Performance C-Beam Plates, I was a skeptic. I couldn't believe that the simple addition of these parts could make such a noticeable difference in a C4's performance. Finally, it became difficult for me to ignore the scores of C4 owners who installed Beam Plates and immediately noticed a improved stability during hard acceleration, so I put a set on my own '95 ZR-1. After a short test drive, I, too, became a believer and wondered why I'd waited so long to install them. True to ZR51 Performance's promises and the many anecdotal accounts of its customers, upon hard acceleration and especially during shifts, my car was more stable when the powertrain torque load changed abruptly. C-Beam Plates greatly reduce this problem. The lower rear C-Beam Plate as installed on the author's '95 ZR-1. ZR51 Performance C-Beam Plates are relatively inexpensive and take a couple of hours to install with the most time consuming part being removal of the car's exhaust system so you can access the C-beam. For more information on C-Beam Plates, visit ZR51 Performance's web site at www.zfdoc.com, email them at Bill@zfdoc.com, call them at 602-319-6575 or write to ZR51 Performance, 5612 East Almeda Ct., Cave Creek, Arizona, 85331-6405.